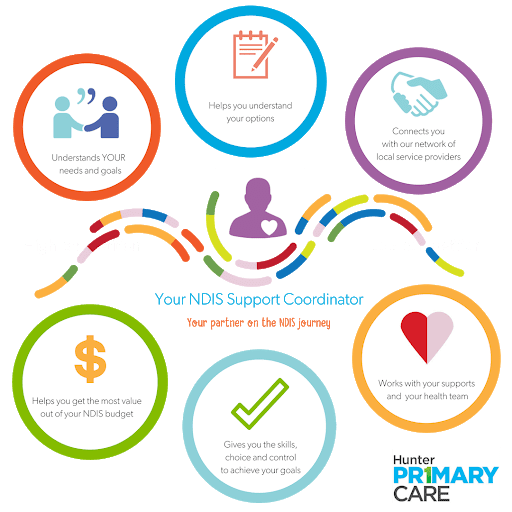 At Hunter Primary Care, your Support Coordinator will connect you with the services you need to get the most out of your NDIS plan. You may need help to work through the stages of planning, arrange appointments to meet service providers and to manage your NDIS budget. This process can often be daunting, but our NDIS team has the skills and experience to guide you through the complexity and confusion so that you can achieve your goals. We are your partner on your NDIS journey. Our focus is on you. Am I eligible for Support Coordination? Support Coordination is a specific part of an NDIS plan that helps you make the most of NDIS funds. Support Coordination will be available in a plan if the NDIS determines that you will find it challenging to find the right supports and services; or if extra help will help you to manage your service providers more easily. Support Coordination is something that you can ask for during the planning process if you need this type of support. If you are eligible for Support Coordination, the service will be listed under the Support Category ‘Improved Life Choices’ in an NDIS plan. The section will clearly state that funds have been delegated to ‘Coordination of Supports’ and a total dollar figure will also be provided. What levels of Support Coordination does Hunter Primary Care offer? Hunter Primary Care offers two levels of Support Coordination in an NDIS plan. Ensuring the best experience and outcomes by using your plan funds correctly. How do I nominate Hunter Primary Care for Support Coordination? Once you choose Hunter Primary Care for Support Coordination and your referral form has been completed, it can be sent through to the Support Coordination team. This will provide us with an understanding of the level of supports and services that you will need. Our Support Coordinators will then contact you (within 2 days of referral) and arrange a meeting (within the next 5 days). If you are unable to complete your referral, contact the Support Coordinations team on (02) 4925 2259.
Who is the Hunter Primary Care Support Coordination team? Hunter Primary Care has a team of committed and professional staff to help you manage your NDIS plan. To learn more about the team, visit our NDIS staff profile page. Can I choose the supports that I would like to receive? The NDIS can pay for supports that are reasonable and necessary for your needs. This means that each plan is related to a specific disability or multiple disabilities for which support is required to help you live an ordinary life and achieve your goals. We will help you to understand the options around supports and services available. Can I choose from support providers? Depending on the level of supports and services written into an NDIS plan, you can choose the providers you want to work with. If you feel that a support or service provider is not helping you as much as you need, a change in provider can be arranged. You do not need to wait until your annual plan review. Click here for information about finding and engaging with providers. Can HPC help me travel to my appointments? All plans are individually assessed and access to transport will depend on the level of Coordination of Supports in the NDIS plan, Each plan is different and tailored to individual needs. Contact the NDIS services team on (02) 4925 2259 to discuss personal planning and support coordination services. Does HPC support diverse and inclusive communities? I need services outside of what Hunter Primary Care provides, what does that mean for me and my NDIS plan? We can assist with accessing supports outside of what is offered within the organisation. Through our network of local medical and allied health professionals, we are able to assist you to find the best suitable support to suit your needs. Contact the NDIS services team on (02) 4925 2259. I have a long-term illness, how can Hunter Primary Care help me with my NDIS plan? Hunter Primary Care has a team of professional staff with a wide range of skills. We are here to make sure that you receive all of the supports that you need. We support you holistically and recognises that you may require access to health care services to assist you manage your health outside of your NDIS plan. Our staff have experience and established relationships with NDIS service providers, GP’s and Hospital staff to support you and health needs. If you have been diagnosed with a long-term illness and need support, contact the NDIS services team on (02) 4925 2259. Are you looking for a specialist service for people with a mental illness or psychosocial disability? Hunter Primary Care’s mental health care coordination team specialises in supporting people with mental illness or psychosocial disability to connect with services that enhance their wellbeing and allow them to work towards their individual goals. Hunter primary Care has highly skilled staff with diverse backgrounds including psychology, social work, mental health nursing and lived experience, who use their expertise to help you navigate mental health services, community groups and activities, and NDIS funded supports. 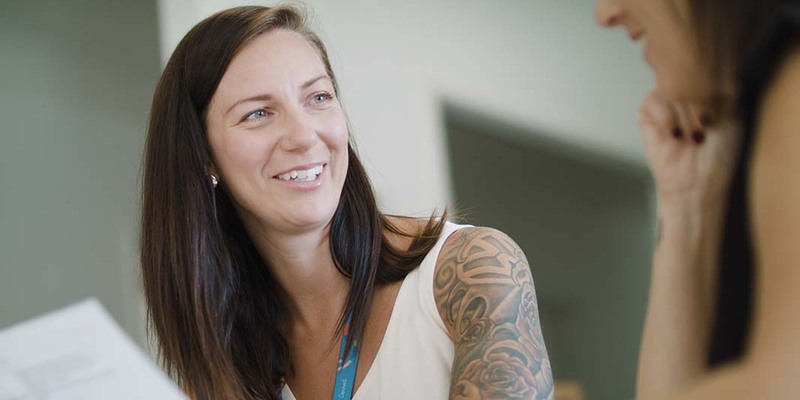 Our expertise in mental health allows our staff to work with you and your family to find an individual approach to your supports that will empower you to pursue your goals and make decisions about how you are supported. I have an Aboriginal/Torres Strait Islander background, how can Hunter Primary Care help me? Hunter Primary Care has Aboriginal and Torres Strait Islander staff members who can provide you with culturally appropriate advice concerning the NDIS. Our staff are well aware of the access to supports and services available in NDIS plans and can help to navigate pathways through the NDIS to ensure that you receive the best quality services available in the region. The NDIS has established an Aboriginal and Torres Strait Islander Engagement Strategy that was developed as a collaborative planning and working model to inform the needs of Aboriginal and Torres Strait Islander peoples with disability, their families, carers and communities. The strategy provides the basis to collectively build inclusion and positive outcomes for Aboriginal and Torres Strait Islander Australians through the NDIS.